The Visshudha (Throat) Chakra is the fifth Chakra, and is located on the spine in the throat area, and is the first chakra to be focused solely on a spiritual plane. It is associated with our ability to communicate, self-expression and purification. It is associated with the color light blue and the element ether (sound). The associated body parts are the throat, vocal cords, esophagus, mouth, teeth, thyroid and parathyroid glands, and upper lungs. Those who are strong and balanced in this chakra are able to express everything to others and themselves in a way that is pure, honest and kind. Even when it’s a “hard truth” that may not be easy to discuss. Those who are overactive in this chakra may speak about themselves or others negatively, criticize, and use overbearing words. They tend to be hyperactive, they overreact, and they are very stubborn. Those who are depleted in this chakra have communication problems. They tend to have a hard time expressing their feelings and ideas, they withhold their words, and they easily surrender to others. Those who are out of balance in this chakra, in either direction, are more prone to such health issues as laryngitis, colds, throat pain, mouth issues (teeth problems, gingivitis, ulcers), thyroid dysfunction, swollen glands, hearing problems, and jaw problems. Personally, this is the chakra that I need to work on the most. I tend to be depleted in this chakra quite frequently. My husband always tells me that I let people walk all over me, and I definitely do tend towards doing whatever I can to make sure everyone is happy, even if it means holding my tongue and keeping my feelings to myself. However, I have been working on this chakra a lot over the past year, and though I’ve still got a long way to go, I am definitely seeing that I am more balanced than before. Incorporating sound into my practice has been what has helped the most, along with Lion’s Breath and Ujjayi Pranayama. The seed sound associated with the Throat Chakra is HAM, and I notice that when I say this sound and put the emphasis on the H (therefore pronouncing it more like “hum”, with the H really drawn out…my husband says I sound like I have a hairball! ), it does wonders for me! For some reason, whenever I practice this sound, I feel extremely empowered after, and I feel like I can say whatever is on my mind, even if it’s tough for someone else (or myself) to hear. The more I work on this chakra, the more I notice that I am able to speak my truth. Whether it’s speaking the truth to myself about myself, or telling someone else my honest feelings, it’s freeing to finally be able to let things out rather than keeping them all bottled up. I hope that by working on this with you in class, you’ll be able to speak your own truth. This past weekend, I had the opportunity to attend a wonderful workshop at the Asheville Yoga Center. As you may know, I am currently pursuing my 500 hour RYT certification with them, and one of the modules I have to fulfill is for Yoga Therapeutics. There are quite a few Therapeutics options to choose from, and one that particularly stood out to me was the one being offered this past weekend: Life Force Yoga to Manage Your Mood. The moment I signed up for this workshop a few months ago, I couldn’t wait for the date to arrive. I think it stood out to me because it focused on using yoga to deal with depression and anxiety. Both depression and anxiety run rampant in my family, and I have many friends and yoga students who suffer from these conditions as well. And honestly, I’ve had days where I’ve been depressed. I’ve also suffered from panic/anxiety attacks. So I know what it feels like, and it’s not fun! Throughout the weekend, we learned a variety of tools that can be used to manage both depression and anxiety. Chanting certain sounds, for example, can boost your energy or calm you down. Same thing with certain breathing exercises – some are very energizing, and some are meant to bring a sense of calm to a person. Probably the one thing that was the most eye-opening for me was how you should move your body for each condition. For example, someone in a depressed state of mind tends to be the stereotypical “couch potato”, not wanting to do ANYTHING at all. My first thought was, “Well, if someone is in that state of mind, then they need to get moving (like a Vinyasa or Power style of practice) to get some energy. Moving gets the endorphins flowing, which makes you feel good.” And that is true…moving is what a depressed person needs to help them get out of their “funk”, so to speak. But jumping right in to a vigorous practice actually causes a depressed person more stress and can actually worsen the depression. Instead, you need to meet the person where they are. Which means they need to start by moving and breathing in a more slow and restorative way, and then build up from there to more energizing types of movements and breathing exercises. Same thing goes for someone with anxiety. This type of person tends to be “jumpy” and their thoughts tend to be all over the place. Their heart rates tend to be high, and their breathing tends to be quick and shallow. Someone in this state of mind needs to calm down and relax. But again, you need to meet them where they are in order to bring them to the point where they need to be. This means starting them off with more energizing moves and breathing exercises, and then gradually bringing them down to slower and more calming moves and breath exercises. It all makes sense to me now, but before this workshop, I probably would have approached people with these issues in the complete opposite way. It was especially cool for me to learn this, because not so long ago, my yoga practice was very regimented. I always practiced a Power or Vinyasa style of yoga, no matter what. And I always wondered why on some days, I would leave my mat feeling defeated or frustrated. After this past weekend, I now think I know why. I was practicing a style that was active right from the start, even on days when I came to my mat with little to no energy. And by practicing in that way on those types of days, my body wasn’t able to do all the things I was demanding of it because I simply didn’t have the energy to give. As I’ve written in several of my previous posts, I’ve altered my personal practice over the past year or so to include meditation, Yin and more restorative routines. I’ve been working really hard these past few months to figure out what my body is telling me each morning, and then practicing in such a way that meets those needs. So intuitively, without meaning to, I have been doing for myself exactly what I learned about this past weekend. And since I have been doing this, I’ve definitely noticed a difference in myself. Because I’m now moving to meet the mood of my body, I feel more joy in whatever movement I am doing, rather than the dread I used to feel. So my hope for you is that you begin to take the time to listen to your own body. Especially if you are someone who suffers from such issues as depression and anxiety. Really take the time to tap in and discover what your body is telling you. By doing this, you’ll discover who YOU truly are, and that is the best gift of all. September 23, 2013 in Health | Enter your password to view comments. For those of you who are not on my Facebook friend list, I just wanted to post this quick note to let you all know that I have had to make the difficult decision to give up my Wednesday morning Power Yoga class at the Fort Mill YMCA. That super early time slot is hard to find a sub for, and with beginning medical treatment next week, I didn’t want to chance having to cancel class frequently if I have “bad” days. Also, rest is crucial to me being able to recover effectively, so I need all the extra sleep I can manage. Today was the last class. However, a friend of mine has offered to take over the class, so as soon as she gets through the hiring process, the class should be back on the schedule. Contact the Y directly to find out when it’s coming back…I’d hate for you to show up and be prepared for yoga, and there is no one there to teach. It will be very hard for me without this class…I started this class myself two years ago, and have a great group of regulars that I dearly enjoy working with. When I am feeling good, I definitely plan on coming and being a student with you. And if the time is right someday, maybe I’ll be teaching it again. At this point, my only regular yoga class will be on Sunday afternoons at Synergy Yoga & Wellness, at their Rock Hill, SC location (at 111 Caldwell Street). Come join me there if you can. It’s a Mixed-Level Vinyasa class that runs from 4:15 – 5:30 p.m. I’d love to have you there! You can go to Synergy’s Web site at http://www.ncyogacharlotte.com for more information. 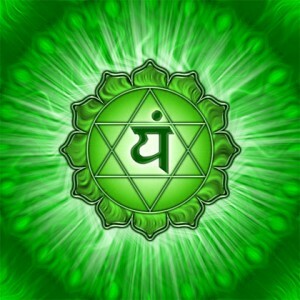 The Anahata (Heart) Chakra is the fourth Chakra, and is located at the center of the chest. It is thought to be our seat of balance. It is associated with the color green and the element air. The associated body parts are the heart, lungs and thymus. Those who are strong and balanced in this chakra are seen as humanitarians. They see the good in everyone, they know what they love to do in life, and they are balanced in the masculine and feminine aspects of life. Those who are overactive in this chakra may be demanding and overly critical. They have huge egos, are inconsiderate and will not go out of their way to help others. Those who are depleted in this chakra tend to be very indecisive and constantly need reassurance from others. They are possessive, melodramatic, and they give only conditional love They are very unfulfilled in life. Those who are out of balance in this chakra, in either direction, are more prone to such issues as heart conditions, high blood pressure, fatigue, asthma, insomnia, and certain forms of cancer (i.e., lung and breast cancer). I look forward to seeing you in class this week. If you can’t join me, try including some of the poses mentioned above into your practice at least once this week and see if you feel a difference. You’ll probably notice you look at things in a much more positive way, and you should also feel more balanced overall. 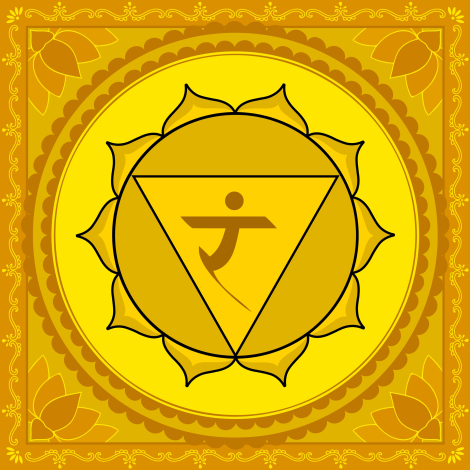 The Manipura (Solar Plexus) Chakra is the third Chakra, and is located just above the navel and below the rib cage. It is thought to be our center of peace. It is associated with the color yellow and the element fire. The associated body parts are the digestive system, the spleen, the liver, the pancreas, the gall bladder and the adrenal glands. Those who are strong and balanced in this chakra have a solid self-esteem, feelings of purpose, a healthy sense of self-respect, and are ambitious and self-motivated. They tend to have great intuition, being able to trust in that “gut feeling” with confidence. Those who are overactive in this chakra may be judgmental and critical, easily finding fault in others. They may have emotional problems, being very rigid and stubborn (“do it my way or no way at all”), angry or aggressive. Many people who are overactive in this chakra are those who are seen as workaholics and perfectionists. Those who are depleted in this chakra tend to be very distrustful of the people in their lives, they have a lot of doubt, and they worry excessively about what others think of them. They worry they are not good enough, and are constantly seeking the approval of others. They often feel depression and anxiety, but avoid dealing with it. 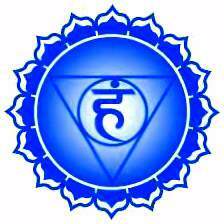 Physically, people depleted in this chakra suffer from sluggishness or malfunctions of the digestive system. I look forward to having you in class this week. If you’re unable to make it, try including some of the above in your personal practice. I’d love to know what you discover. 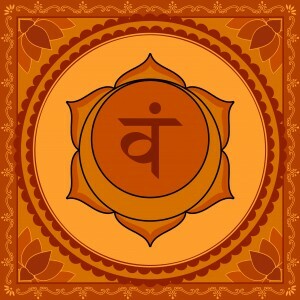 The Svadhisthana (Sacral) Chakra is the second Chakra, and is located in the lower abdomen, approximately 2 inches below the navel and about 2 inches deep. It is thought to be our most important emotional center. It is associated with the color orange and the element water. The associated body parts are the ovaries, adrenal glands, spleen, uterus, urinary system, prostate gland, uterus, cervix and lower bowel. Those who are strong and balanced in this chakra radiate warmth and friendliness, and they are open to the world around them. They have energy, compassion, emotional stability, and they genuinely love life. When this chakra is out of balance in some way, it causes people to have issues with trust, they tend to be hypersensitive, and they can be emotionally volatile. Those who are depleted in this chakra tend to be completely disconnected and cold towards others. Those who are overactive in this chakra tend to be needy and emotionally dependent on others. No matter where you feel you are at the moment, everyone tends to get out of balance in some way with this chakra now and then. Because it IS thought to be our emotional center, it is very difficult to keep it balanced, so we will be working on how to do just that in class this week. Meditate and let go: When we can learn to let go of anything that doesn’t serve us, anything we don’t need to be carrying around with us, we open ourselves up for new and better things. Meditation is a great tool in helping us bring things into perspective and realize what is helping or hurting us. I hope to see you in class this week, but if you’re unable to make it, try doing some of things mentioned above at least a couple of times on your own. Even just a few minutes focusing on this chakra can make a world of difference in our emotional health.